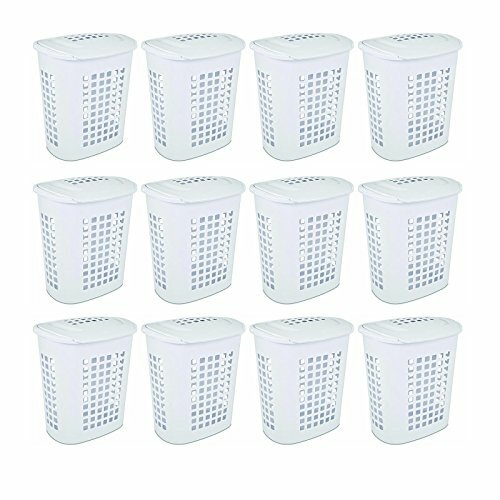 No need to air your dirty laundry when you have the 12 pack of Sterilite 2.3 Bushell Lift-Top Laundry Hamper Baskets. Don't feel like doing laundry today? That's okay. This XL laundry basket holds up to 2 loads of laundry. Each basket comes with a detachable lift-top lid to hold and hide your dirty laundry. It is also made out of durable plastic, so it is easy to clean when life gets just a little bit messy. Stay happy, organized, and clean with the Sterilite 2.3 Bushell XL Lift-Top Laundry Hamper Basket.